Only for the brave, our vibrant green retro glass cabinet will add a further dimension to your interiors. The marvellous shape is inspired by classic Art Deco designs and will be sure to take pride of place in any room. Featuring 2 centrally hinged doors with glass fronts, three internal glass shelves, and adorned with a striking green faux leather Moc Croc finish. This piece would make an amazing cocktail bar or display cabinet. Definitely a statement piece that defines a non-confirmist attitude to life, this piece of furniture that is fun, vibrant and brings the retro past into urban chic modernity. 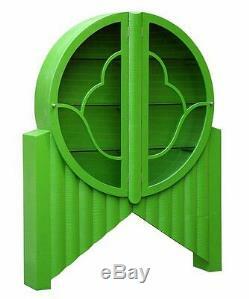 An Art Deco style large glass cabinet with two inner shelves and bright green Moc Croc finish. Two centrally hinged glass doors. Avoid the use of chemicals and household cleaners as they may damage the finish. Pairs well with other pieces in the Moc Croc collection. You can pay for your item as follows. Please note that a lot of our items are'Antique Reproductions' and with that may come certain imperfections or fading, and are deliberate effects of the style. All items are handmade and hand-finished, which sometimes results in slight variations between pieces. It is natural to expect and appreciate these discrepancies as a feature of our products. Please also be wary that colours may vary slightly to the pictures shown on our website. The item "Green Moc Croc Vintage Retro Vintage Glass Cabinet shelves 139x28x178cm DUSX" is in sale since Monday, January 30, 2017. This item is in the category "Home, Furniture & DIY\Furniture\Cabinets & Cupboards". The seller is "dusx" and is located in Lincoln. This item can be shipped to United Kingdom.